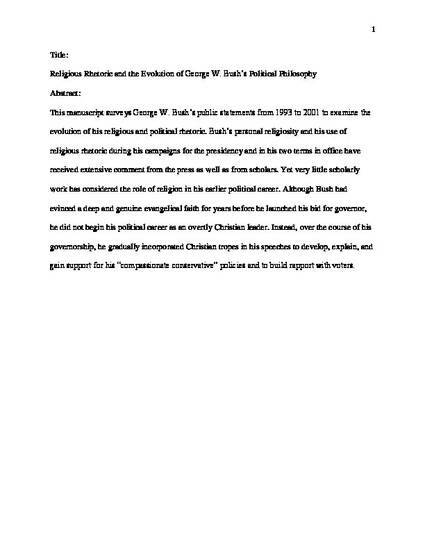 This essay surveys George W. Bush's public statements from 1993 to 2001 to examine the evolution of his religious and political rhetoric. Bush's personal religiosity and his use of religious rhetoric during his campaigns for the presidency and in his two terms in office have received extensive comment from the press as well as from scholars. Yet very little scholarly work has considered the role of religion in his earlier political career. Although Bush had evinced a deep and genuine evangelical faith for years before he launched his bid for the governorship, he did not begin his political career as an overtly Christian leader. Instead, over the course of his governorship, he gradually incorporated Christian tropes in his speeches to develop, explain, and gain support for his “compassionate conservative” policies and to build rapport with voters.